Home / Life Hack Tips / 10 strong reasons why should you delete negative people from your life? 10 strong reasons why should you delete negative people from your life? This is a famous quote from greatest scientist Sir Albert Einstein. But why he believes to stay away from poisonous people, you must think about it. Different people hold different personality, different people carry different thinking, different people react differently in the same situation. Some people are energetic and optimistic and they try to spread positivity around them but some folks are toxic and they can hack your emotions and change your personality by using their weapon of a negative mindset. It’s necessary to avoid and delete such negative people from your life. Here are the top reasons why should you delete negative people from your life and how to deal with negative person. How to transform Negative thoughts into positive. Negative people don’t believe in positive thinking. They always try to believe in negativity. They won’t allow you to develop a positive outlook, as long as you are with them they will try to trap you in the destructive and unrealistic situation. Positive people have a solution to every problem but negative people have a problem with every solution. They think for problems rather than solutions. If you tell them about the strong possibility of earning money from any business they will definitely come up with the difficulties related to business. They are the destroyer of self-confidence of other people by using an arsenal of vicious behaviour. They are low self-esteem people, so they always think to demolish the confidence of other people around them. They are people with a disastrous mind and they always try to harm the self-assurance of other people, so it’s better to leave such people from today. They don’t appreciate your good work simply because they are jealous of your outstanding qualities. They are envious people who don’t want to push up you by admiring your qualities and strengths but they always try to find a fault in your every decent effort. Why you must use positive words in your conversation? Negative people have strong willingness to spread ignorance and hatred in their surroundings. All the time they think to deploy rumours in society. They feel immense pleasure by doing so. They don’t add value to your life but they try to rob your conscious and subconscious mind by injecting rubbish thoughts in your mind. Some people will always stand with you in your tough time but some will leave you in a strange situation. Selfishness is a special quality of negative people. They are selfish people who always look for some kind of benefit from you; they are not your true friends they are simply with you because they want money or support from you. Your personality is a reflection of your habit. Negative people want to bring you down. They want to kill your self-respect by forcing you to adopt the bad habits of smoking, drinking or gambling. They want companionship for their evil habits so they will always force you to link massive pleasure to bad habits. Learning is a sign of aliveness. If you are learning, you are moving ahead. If not, you are dead. People of negative character and behaviour don’t invest in learning life lessons or skills. They believe they know everything. Negative people around you criticize you for learning new things or new skills because they are lazy people. They don’t believe in hard work, they don’t believe in raise their standard. They carry strong reason for their every evil will and you can’t think about their intention.If you want to do something extraordinary in your life kick off the negative people from your life as soon as you can. The people of negative mindset can’t think out of the box idea but if you have a multi-million dollar idea still they think you are some kind of fool. They know you have an outstanding idea but they simply don’t consider it because they don’t want to see you as a famous and rich person. They discourage you to not come out from your comfort zone. They can really convert your brilliant idea into the garbage and useless thought. 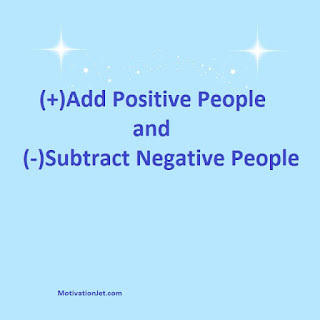 Subtract such nasty people from your lives to live a better, free and ideal life. Beautiful Song of Life for Inspiration. Negative people are usually unhappy with their lives so they always try to bring unhappiness in your life too. They don’t know what the true happiness is, they don’t know what brings the joy in life, they don’t know what the importance of inner peace in life. They never feel calmness and joyfulness in their lives. They can hijack your happiness by creating nuisance in your life. They have evil intentions to hostage your pleasure of life and by doing this they feel a sense of greatness. This is the strong sign for you to weed out such a poisonous people from your life and to stay away from such negative energy people. 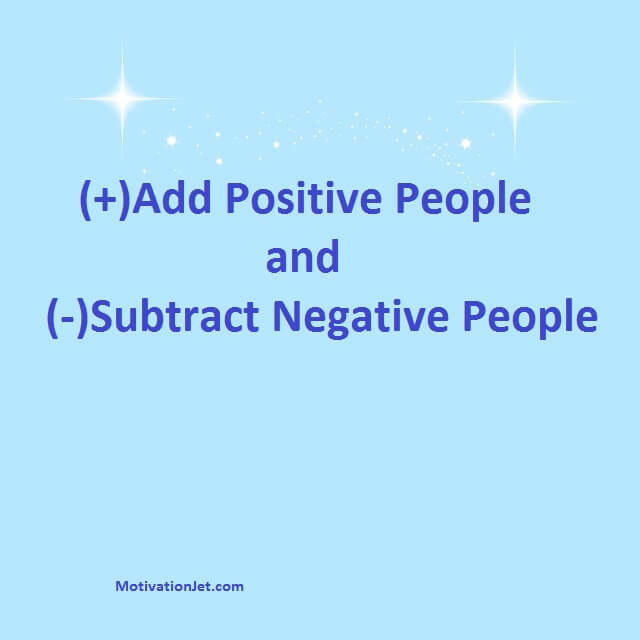 (-)Subtract negative people from your life as soon as possible. If you like this article, do share on social media with your friends and family.